“Street Poems” is the creative collaboration between Poet Laureate Marie Howe and Artist The Mazeking. 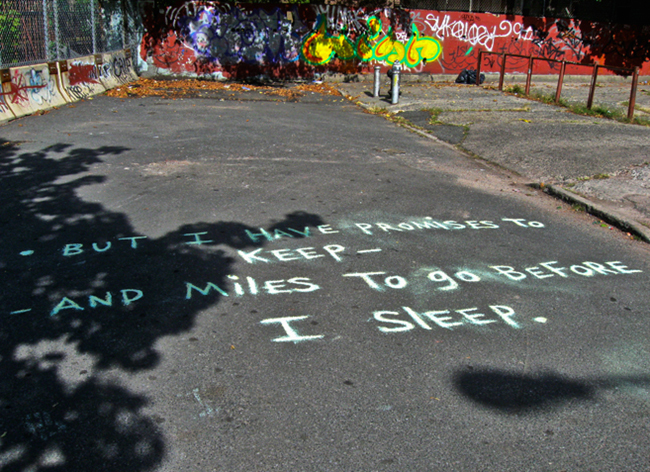 The two artists went about placing lines of poetry in public spaces throughout New York City, from October to December 2013. The poetic lines were placed in various spots such as, sidewalks, cross walks, or simply in the street. Which brought the public into direct engagement with both the visual and literary elements of the project.